This chapter is organized as follows. In Sect. 8.2, generalized renewal processes constructed from random sequences are studied and a number of results are proved on the relationship between the SLLN for the underlying random sequence and the SLLN for the corresponding renewal process. These results explain the nature of the SQI-, PRV-, and POV-properties of the normalizing sequences under rather simple conditions, for which these properties are satisfied. Generalized renewal processes constructed from stochastic processes are studied in Sect. 8.4. 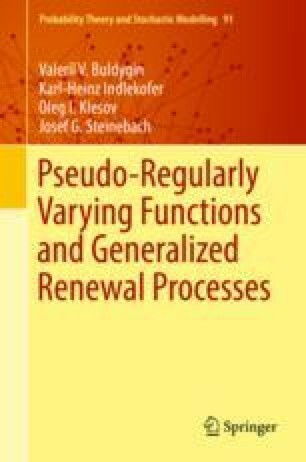 The results of this section also explain the role of the SQI-, PRV-, and POV-properties of the normalizing sequences in the SLLN for renewal processes. In addition, we make clear, why the requirement of continuity of the paths of the underlying process is important. The results of Sects. 8.2 and 8.4 are used in Sects. 8.3 and 8.5, respectively. These sections contain a discussion of several particular questions.